WRLD has been creating a 3D map of the world since 2010. Our mapping platform streams from the cloud in real-time to users globally on mobile, web, desktop, VR or AR apps. Our proprietary technology procedurally renders GIS and other location data into an intelligent 3D representation of the world, so developers can create more engaging applications for the delivery of geolocation services and information, such as Internet of Things data. At present, our mapping platform has full coverage for such countries as the United States, Canada, United Kingdom, Ireland, Scandinavia, the Arabian Peninsula, Italy, and more. We have partial coverage available for regions such as Spain and Australia, and are nearly complete building a 3D map of Thailand. Our 3D mapping platform now represents over 300 million square kilometers. Map process lead times and how you can request new regions to be available in WRLD. At WRLD, our goal is to build the most intelligent representation of the world in 3D from quality data sources. We have access to global GIS and location data from a number of special vendors that we select based on the quality and accuracy of their specific regional data. This global data provides the key information such as building footprints, land cover polygons, road polylines, terrain data and more that WRLD uses to produce an immersive mapping platform. For example, we work with TomTom as an essential source for WRLD global mapping data, providing navigable road network coverage, building footprint data across most major metropolitan areas worldwide and 3D landmark models for most major landmarks. For areas with limited or sparse mapping data availability, we are able to acquire additional geographic information data from our established partner network. WRLD is also able to use and convert data from OpenStreetMap under an Open Database License. In cases where source map data is unavailable or the fidelity of the data is poor, additional mapping information data may be required. The case study featured in this article on Rio de Janeiro describes an example project where multiple map data sources were used to provide highly detailed 3D maps for a customer application. WRLD can also produce 3D maps directly from country-by-country mapping data vendors such as Ordnance Survey in Great Britain and Zenrin in Japan. The case study of Japan below illustrates an example of using Zenrin country-specific source mapping data to build nation-wide 3D maps for their mobile application. Note, we rapidly build additional areas upon commercial interest and prioritize the map processing pipeline based on requests from our community. Coarse land cover polygons, including categorization: urban, residential, commercial, transportation, agricultural, forest, etc. WRLD can ingest a variety of data formats including vector data in ESRI Shapefiles & GML and raster data in GeoTIFF. The data pipeline is flexible so additional formats can be rapidly supported for input. In areas of high importance (i.e. where detail of important landmarks are needed) the maps are manually edited to provide high fidelity visual cues. Map experiences built using WRLD can also incorporate custom 3D models of buildings (including indoors) or other 3D objects to further add to visual acuity and spatial understanding of the world. 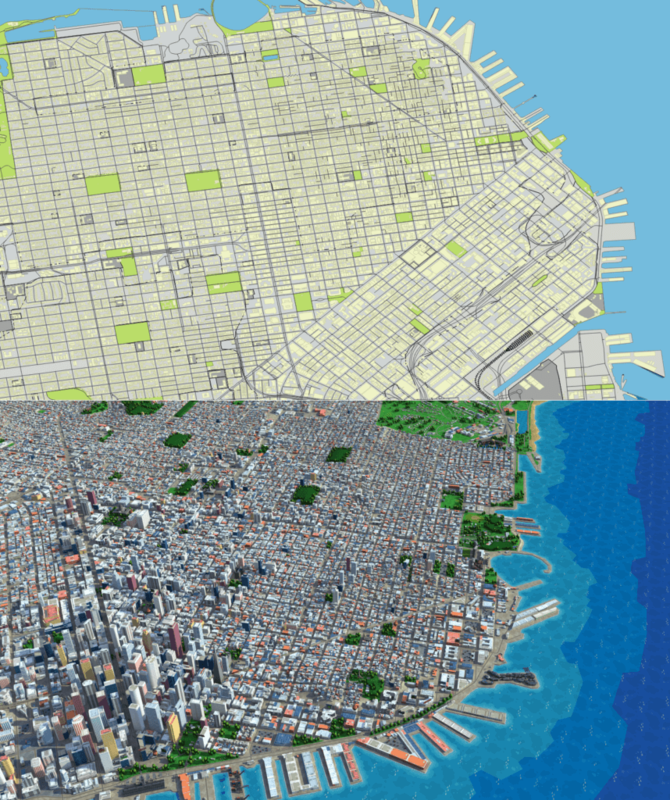 The images below show 2D source mapping data for downtown San Francisco and the resulting WRLD 3D map procedurally generated from that 2D source data. For Zenrin DataCom Co., Ltd. WRLD produced a 3D map for the whole of Japan covering over 377,000 km squared. 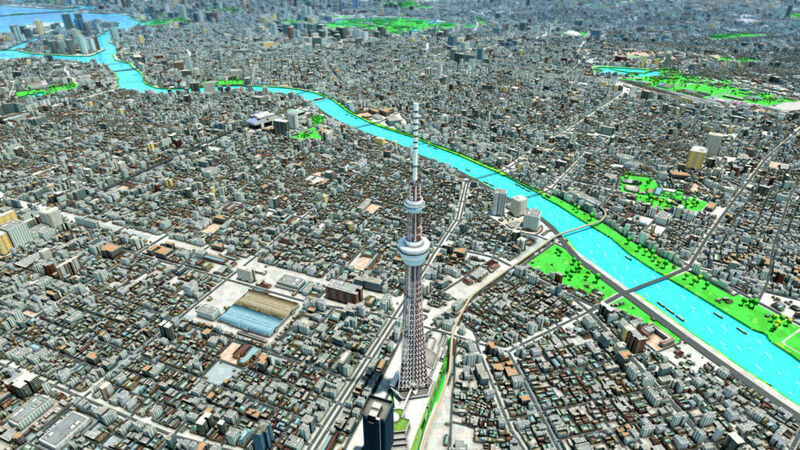 The resulting 3D maps can be seen in the NTT DoCoMo app 3D地図 in the Japanese Android Play store and Japanese iOS App Store. WRLD generated the Japanese 3D maps using entirely new source data from a new vendor. WRLD also produced stylized maps for Japan, including rice fields, cherry blossoms during springtime, and procedurally generated temples. The project to provide 3D map coverage for the whole of Japan, including ingestion of new vendor data and customized stylization, took only 2 months. Zenrin were able to deliver an application for NTT DoCoMo that included highly detailed 3D mapping with instantly recognizable landmarks and localized environmental cues. Hubio worked with WRLD to produce a 3D map of Canada, covering over 9,984,000 km squared. 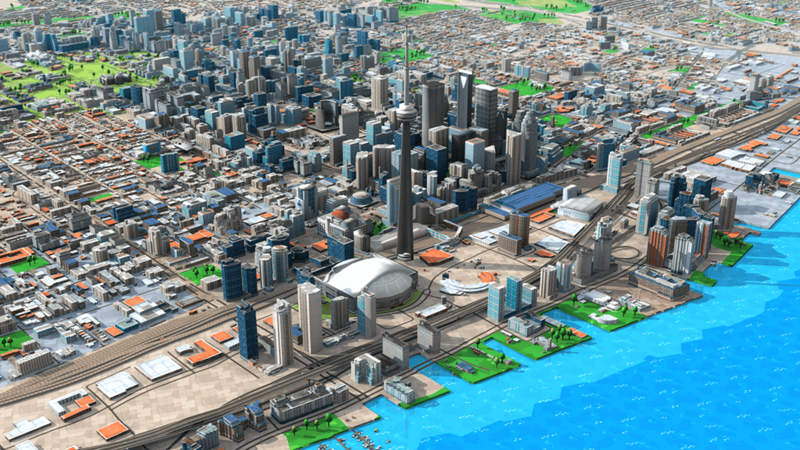 WRLD generated the Canadian 3D maps using source mapping data from an existing vendor augmented with a small amount of data from a new public domain vendor. The project to deliver 3D maps for the whole of Canada took only 6 weeks, allowing hubio to rapidly build and deploy their mobile applications. For Samsung, WRLD produced a 3D map of Rio de Janeiro to coincide with the Brazil 2014 World Cup football tournament, covering an area of 1,600 km squared. WRLD generated the Rio de Janeiro map using source data from an existing vendor, together with additional mapping data from a private data vendor. 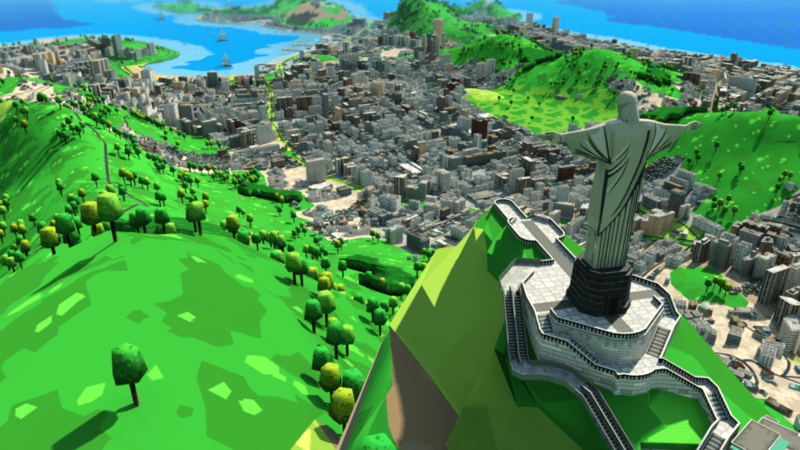 WRLD produced stylized maps for Rio de Janeiro and additionally hand-modeled over 100 important landmarks, including Christ the Redeemer, Copacabana beach and Sugarloaf mountain. The project to deliver the initial 3D mapping for Rio de Janeiro took 4 weeks, with an additional four weeks being spent on custom map design and hand-modeling. Our map processing pipeline is determined by commercial interests and incoming requests received from our developer community, which we encourage you to join! We can rapidly provide full map coverage in as little as a couple weeks of countries/regions depending on their size and density. Sign up to request a new area, or contact us to about your project needs and we can discuss expanding our map coverage to support you.